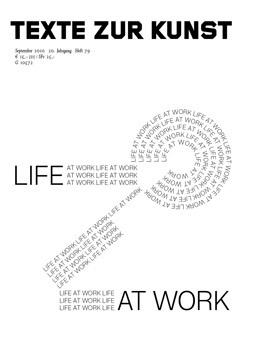 This issue of “Texte zur Kunst” bears the programmatic title “Life at Work”. Admittedly, this means to take up quite a bit, for at issue is nothing less than revaluating a theoretical and historical relation that has determined the history of modern and contemporary art like almost no other: Since “around 1800”, the forms of art have been ascribed a quasi-organic life of their own. An important trend in modern aesthetics sought to evoke liveliness, with the aim of offering resistance to the commodified world of capitalism itself. But how does this problematic pose itself today? Is a critical reference to “life” in art and beyond at all possible after theories of biopolitics have insistently argued that capitalism has permeated all areas of life? The link below connects to a recent report issues by the New Economics Foundation on how the value of work is calculated. It can be dowloaded in .pdf format, or ordered printed and bound. Thank you for passing this my way, Monika!! Pay matters. How much you earn can determine your lifestyle, where you can afford to live, and your aspirations and status. But to what extent does what we get paid confer ‘worth’? Beyond a narrow notion of productivity, what impact does our work have on the rest of society, and do the financial rewards we receive correspond to this? Do those that get more contribute more to society? The report offers a series of policy recommendations that would reduce the inequality between different incomes and reconnect salaries with the value of work.